On the 12th October, the 11th Annual Internet Retailing Conference (IRC16) will take place in London’s Novotel West and Optilead are proud to be amongst the prestigious exhibitors. Optilead’s own research conducted this year highlighted that 74 of the IRUK Top100 failed to follow up cart abandonment – and are at risk of losing significant numbers of sales each year. We identify in excess of £125m worth of abandonment each week. From our vast experience we know that on average 76% of shopping carts are abandoned online, often for relatively trivial reasons such as delivery costs and times. So the opportunity for businesses to overcome these issues and increase online revenue is impossible to ignore. Have you registered for the Internet Retailing Conference? It doesn’t matter what you sell online, customers who leave items without paying are every ecommerce store’s biggest problem. Our Cart Recovery solution enables ecommerce stores to engage in real-time with shoppers that abandon carts, utilising our multi-channel solution can see increases of conversions up to 47%. Our Customer Engagement Specialists will be on hand to show visitors to the event how they can significantly increase online revenue with a multi-channel cart recovery solution. IRC16 has lined up some of the leading figures in online retail to speak at the event, including those from Halfords, B&Q and LEGO, so it’s a fantastic opportunity to gain and share insights with other people who are passionate about running a successful ecommerce business. 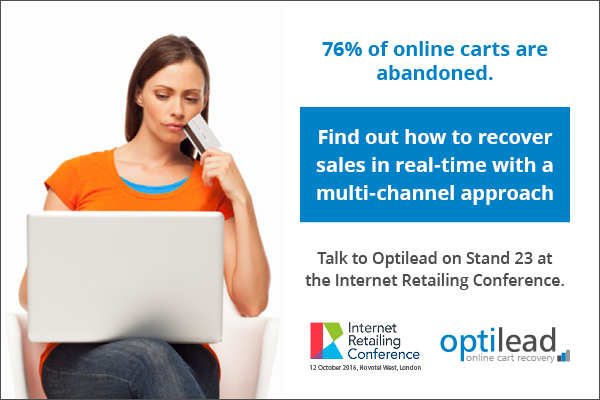 If you plan to visit the Internet Retailing Conference, please ensure you have registered and take a few minutes to visit Optilead on stand 23 and speak with one of our friendly specialists, it’ll be great to meet you!